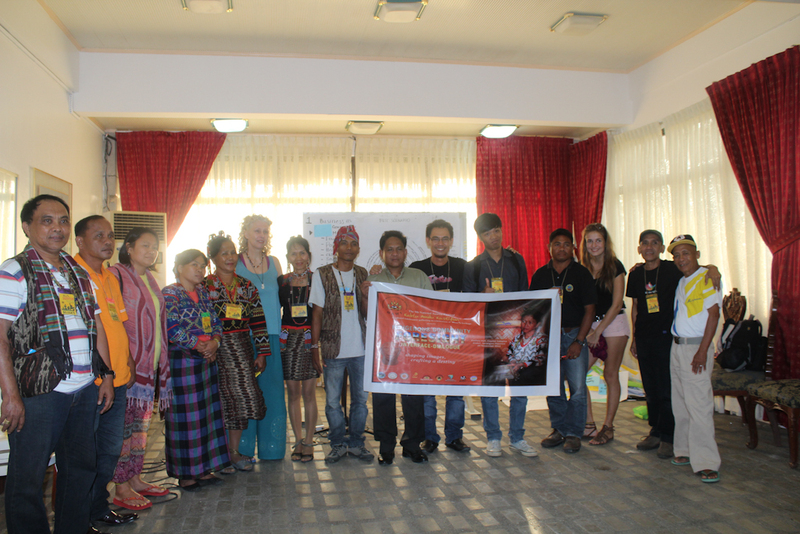 Last year (November), the Center for Engaged Foresight facilitated an indigenous community foresight workshop for the Muna To people of the Province of Saranggani. 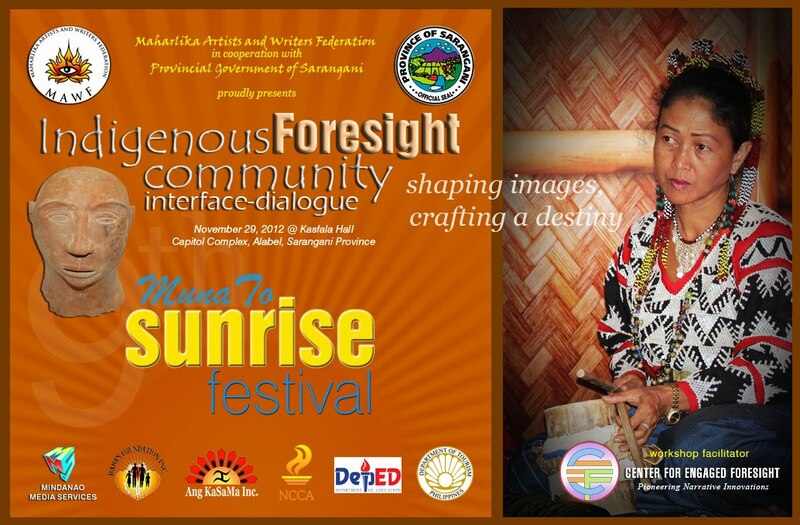 The event was held in conjunction with the celebration of the 9th National Sunrise Festival, an annual roving arts and writers festival in the Philippines organized by the Maharlika Artists and Writers Federation (MAWF), and the Muna To Festival 2012, a province-wide local indigenous festival showcasing Muna To heritage, arts and cultures. Muna To, according to Ms. Eleanor Saguiguit, former tourism officer and now a member of the legislative board of Saranggani, is the native word for the “first people” of Saranggani. At the Kasfala Hall (known as the justice hall of the indigenous hall), around 25 participants comprising of indigenous peoples leaders and chairs, government officials, NGOs, artists, writers and volunteers attended the workshop. STEEP analysis, the futures triangle and scenario building tools were used to explore and navigate Muna Tos alternative futures. Initially, the participants map the drivers, barriers and possible images of the future using the futures triangle. 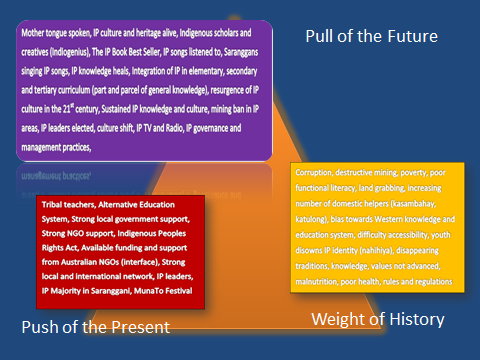 The futures triangle is a futures tool invented by Sohail Inayatullah to map and navigate focal issues of the past, present and the future. After the futures triangle sessions, the group facilitated a STEEP analysis workshop to identify the key drivers of Muna Tos future. We learned that governance and mining were the most important drivers of Muna Tos future. Mother tongue spoken, IP culture and heritage alive, Indigenous scholars and creatives (Indiogenius), The IP Book Best Seller, IP songs listened to, Saranggans singing IP songs, IP knowledge heals, Integration of IP in elementary, secondary and tertiary curriculum (part and parcel of general knowledge), resurgence of IP culture in the 21st century, Sustained IP knowledge and culture, mining ban in IP areas, IP leaders elected, culture shift, IP TV and Radio, IP governance and management practices. Tribal teachers, Alternative Education System, Strong local government support, Strong NGO support, Indigenous Peoples Rights Act, Available funding and support from Australian NGOs, Strong local and international network, IP leaders, IP Majority in Saranggani, Muna To Festival. Corruption, destructive mining, poverty, poor functional literacy, land grabbing, increasing number of domestic helpers (kasambahay, katulong), bias towards Western knowledge and education system, the youth disowns their IP identity (nahihiya), disappearing traditions, knowledge and values not advanced, malnutrition, poor health, rules and regulations / existing laws/society not sensitive to IP ways of knowing and way of life. 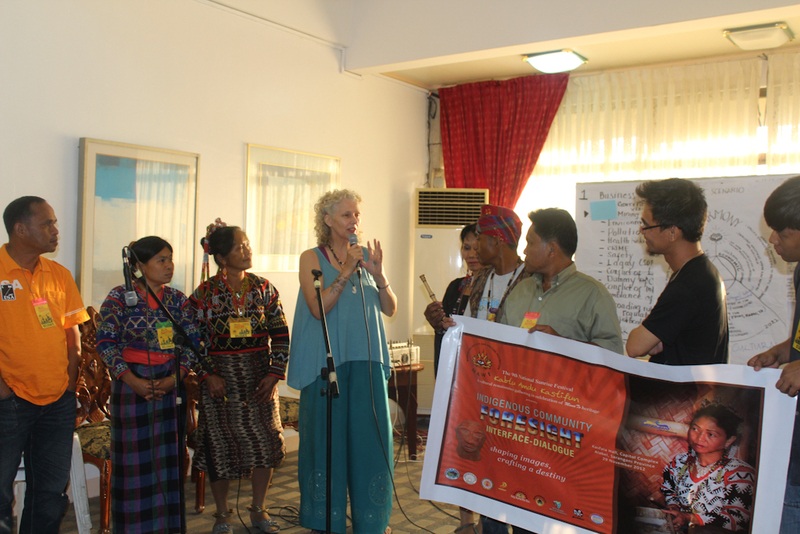 Using governance and mining as drivers, the participants came up with at least three plausible futures, these are: the long road to prosperity and the lonely Muna To future; the Indio-Genius future and the Organic-Agri-Cultural Progress Future: The Muna To Dances and Sings Forever. In futures studies, scenario building is a tool used to stimulate creative thinking and foresight. As a planning tool, it can help generate long-term policies, strategies and plans. Scenarios are also used for innovation development and to generate new product ideas for specific fields and interests. Its purpose is not to predict but to create and test a range of possible future conditions. In scenarios, assumptions are enriched by a mix of narratives describing important events and developments that shape an idea, a product, a policy or a community or peoples future. The long road to prosperity and the lonely Muna To is a scenario where destructive mining and corrupt government practices drives Muna Tos futures. While the Muna To people constitute the political majority of Saranggani, their voices and interests could hardly influence Saranggani’s socio-political-economic development trajectory. Deprived of a transparent, accountable government and responsive “first people” policies (an environment/land use/economic plans that guarantee ancestral preservation), initiatives (socio-cultural sensitive impact assessments) and programs (education programs that promote/advance indigenous knowledge), the Muna Tos, the people, their heritage and way of life are at risk and faces the possibility of extinction in the year 2040. Due to an increasing incidence of physical, structural and cultural violence (their wisdom ignored and access to rights and opportunities limited and restricted), the image of a barren, devastated and abandoned ancestral lands and villages was vivid in this scenario. The images of flooding, the skirting of Philippine mining laws, the pollution of critical watersheds and damaged agricultural lands were the litany of fears and accidents that drove Muna Tos extinction. The long road to prosperity was hard and the lonely Muna To perseveres to overcome a dry, solitary, unhappy and traumatic life. This scenario is a story where, at the risk of many, the Muna To opted to extend the limits and dangers of the status quo. As the Muna Tos were silent about the “business as usuals”, it unknowingly perpetuated the “used” and “disowned” futures. The workshop participants was able to construct at least three out of the radar scenarios here. The Indio-Genius Muna To alternative future was the workshops outlier scenario. This story anticipated a Muna To future where in the course of a large scale mining operation somewhere in the year 2030, miners found a massive pre-historical site, decorated caves, prehistoric piles, dwellings and artifacts detailing the Neo-lithic, Bronze age of pre-colonial Philippines in the mountains and ancestral lands of Saranggani. This “unforeseeable event” would force the government to suspend and cancel the large scale mining operation and declare the site as a national treasure and national historical site. The area will be protected for the sake of the future generation. The Muna To ingenuity saves the future of Muna To. Another out of the radar scenario was, that in the middle of a large scale mining operation in Saranggani, the sky high prices of gold and other metals crashed in the global market. This event would force large scale mining companies to close shop in Saranggani. The prices of gold, silver and iron ore plummeted into record lows. Hence, the huge drop in metal prices to occur (the price of gold was almost like the price of scrap metal). This would force the crash hit hard mining companies to declare globally wide bankruptcies. This event creates a significant shift in Saranggani’s economic development agenda. After the event, the province would spotlight rainforestation and reforestation as the key to long-term sustainable development. The participants also had a scenario where a big earthquake and flooding disrupted large scale mining operations in Saranggani. While there were no reported deaths in said earthquake and flooding, the mining sites were destroyed rendering huge financial losses to mining operators. The mining companies could not recover the losses and opted to declare bankruptcy. Another off the radar scenario was the story where the chief executive’s family, caught in between hazards, suffered an accident from a trench and excavation collapse in a visit to a mining site. Resulting to serious injuries of family members, friends and workers, the incident prompted the chief executive to change his/her views on large scale mining and public safety. Because of that incident, mining was banned in Saranggani and the chief executive decided to adopt, invite and promote a more inclusive, indigeneous friendly and public safety oriented industries. Healing technologies and healing industries were introduced in Saranggani after the event. The Organic-Agri-Cultural Progress: Muna To Dances and Sings Forever! The organic-agri-cultural progress scenario spotlights the best possible future for the Muna To of Saranggani. This scenario suggest a story where cultural power drives the future of the Saranggans. 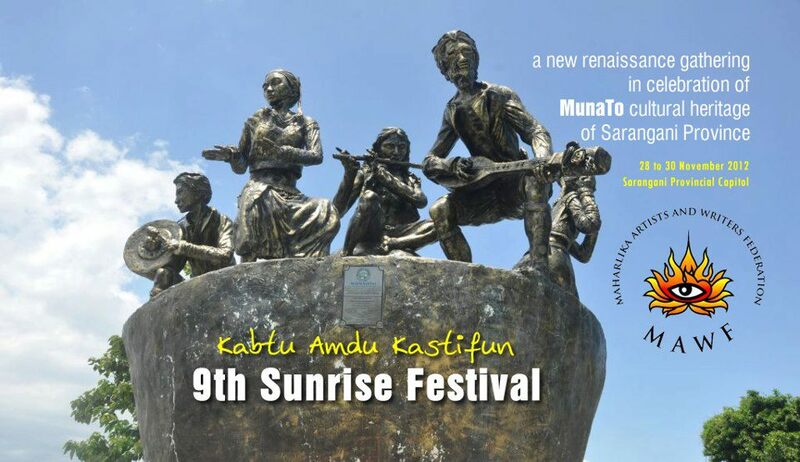 The Muna To people, in this story, realized the power of culture to transform Saranggani. Through cultural education, arts and activism, thousands of cultural creatives emerged in Saranggani. 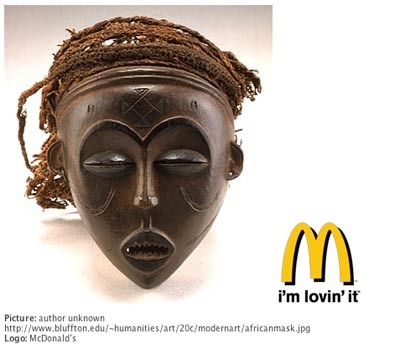 These cultural creatives and advocates would invent, create, and mobilize the Muna To community. Philosophers, painters, artists, inventors, scholars, intellectuals and leaders challenged the status quo.Mining was banned in the year 2030 and the banner “Kung walang Mining, Buhay ang IPs” advocacy inspired the governor to issue a 25 year mining moratorium on large scale and small scale mining in Saranggani. Mining projects were deemed incompatible with Saranggani’s long-term cultural and environmental agenda. The wise crowd of Saranggani elected a Muna To tribal leader as their governor and a Muna To national artist would inspire the people to advance the “ORGANIC-AGRI-CULTURAL” Saranggani agenda. Cultural power, good governance, foresight and alternative forms of economics fueled Muna Tos social transformation. The story includes the full integration of IP knowledge in school curriculum (indigenous concepts , philosophy and knowledge part of mainstream knowledge), of tribal music and songs shining in the local and international music industry. Muna To indigenous healing practices and systems were enhanced and become integral to local and national government’s preventive health care programs . In this scenario, it is the “organic-agri-cultural will” that transformed Saranggani’s future.